Audio Production & Journalism Class at CSP Solano - 2018 Nov. 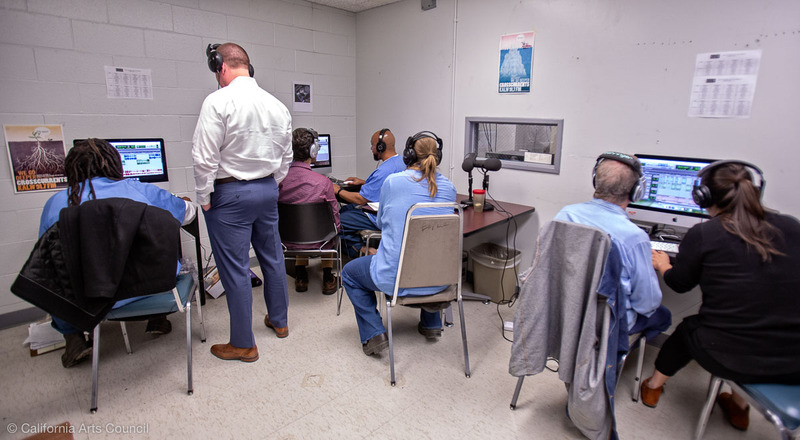 This class in audio production and journalism at California State Prison—Solano is taught by Eli Wirtschafter, Jessica Placzek, and Andrew Stelzer (not pictured) of radio station KALW. Esteemed guests present at this session were Dr. Brant Choate, Director of Rehabilitative Programs at CDCR; Krissi Khokhobashvili, Deputy Chief in CDCR’s Office of External Affairs; Dr. Kenya Williams, Principal of Correctional Education Programs at CSP-Sol; and Pamela Ditto, Vice Principal of Correctional Education Programs at CSP-Sol. During this session students discussed their ongoing class projects, worked with the instructors on editing their recorded pieces, and took turns interviewing Director Choate. Student pieces ranged from light-hearted (the “lizard whisperer” of CSP Solano) to profound and personal (commutation of sentences by the governor.) The students' work is aired on KALW in the series Uncuffed. You can hear it at www.kalw.org/uncuffed. The class is part of Arts in Corrections; funding for these photographs was provided by the California Arts Council.